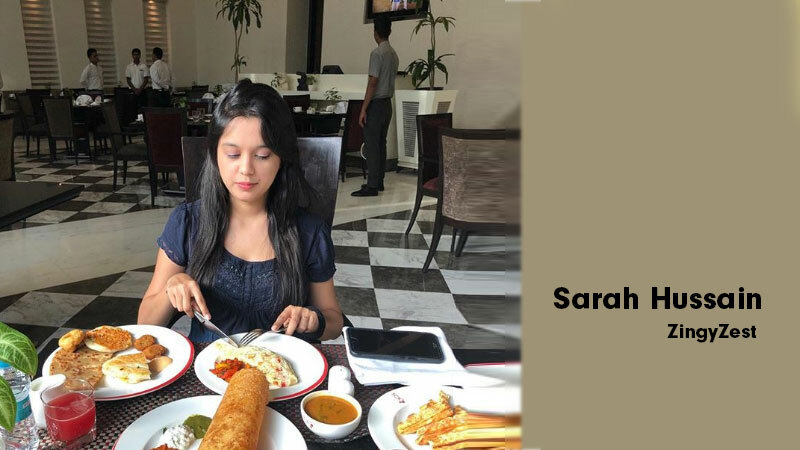 Sarah Hussain, shares some inside dope going behind her blog ZingyZest and how her love for food photography made her start a page on Instagram. What started as a hobby back in the college days went on to become a full-fledged career stream for Hussain, who says that she loves what she does. From her approach towards brand collaborations to the one moment that made it all worthwhile, Sarah Hussain, gets candid with Social Samosa. It all began when I was 19 years old, doing my graduation. Being in Delhi University I had a lot of free time, instead of wasting time with unproductive things people often indulge in college, I wanted to do a lot more. I was a part of a lot of societies, and my love for food photography made me start the page on Instagram. Well, I never wanted to keep something really common, that’s why ZingyZest. Honestly, I wanted to be a little “hatke” so my google SEO comes really clear because I knew I’ll make it google search someday. My page has totally organic followers, and they really love me. Which makes me responsible for promoting the right kind of things on my page. I’ll never appreciate something which I didn’t like. The trust my followers have in me makes it my USP. How does your content give you an edge? I never promote something I feel is something I will never use. I never indulge in direct marketing because that are really ads, and no one enjoys ads. I try to make a product relatable by actually using/ eating it, and showcasing how it’s useful to me. As they say, if you’re good at something, never do it for free. There’s a lot of efforts that goes into creating content, brands have actually started to recognize it over the years, they have a set and good budget for influencer marketing and they’re ready to pay for quality content. Saying NO to free collaborations in the name of exposure, barter, experience, is something which helped me in the same. I was at Amity University to deliver a speech on entrepreneurship and was surprised how everyone knew me already, and how everyone wanted a selfie with me. Instagram India releasing a list of Top 10 Food hashtags, #ZingyZest being one of them. Also, when I had my interview and picture published in a leading newspaper. Leaving working for free aside, a brand wanted me to project myself that I’m successful because I use a certain fairness cream. (No it wasn’t fair and lovely). I declined it, as the brief was funny and sad at the same time. I’ve done my post graduation in Public Relations and Corporate Communications from Canada, so most probably I would’ve been doing that only. Wake up, reply to mails, get ready and go to shoots for brands, make YouTube videos, food reviews, coming back home I edit my pictures, while Saurav my partner edits the videos for YouTube. An entrepreneur never has a weekend. Success comes to those who wait, failure will make you stronger. Work hard, and there’s nothing that can stop you. Being not only the biggest Food and Lifestyle Blogger In India, but also overseas making my nation proud. It’s difficult, but I can do it, and I will.